I wondered if I should post it as is, or go ahead and avoid the controversy by digitally erasing the door sign. This picture has been in my collection for many months and I finally decided to post it as is. This particular image is a Velox taken between 1907-1914. The KKK of the 1910s-1920s was the second incarnation of the group first emerged in the 1860s. While the Southern chapters still focused on racism against blacks, the Northern and Midwestern ones were fueled by the liberalisation of society, mounting integration and increasing tensions between established whites and Eastern European/Jew immigrants and southerners (black and white) moving into the cities and competing for jobs. Members of the South were patriarchal staunch anti-Catholic protestants, but all -North or South- were prohibitionists. 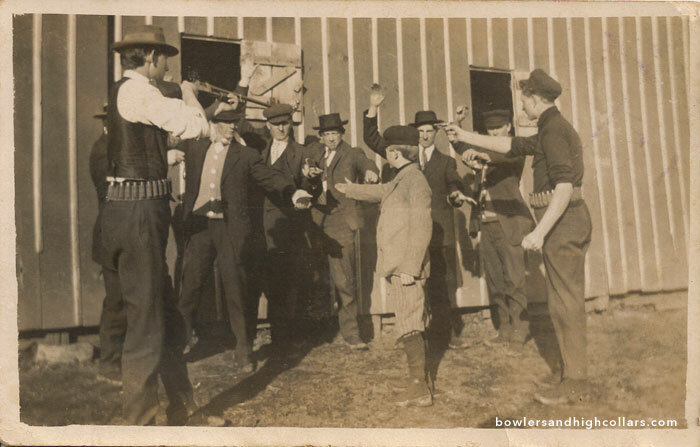 Violent incidents were frequent between bootleggers and KKK members. The movement reached its peak in the Twenties. Some estimates put the membership total at the time to about 8 million members. In Indiana alone 40% of men were members and the group elected a governor. The manufacturing city of Detroit counted an astonishing 40,000 members within the city limits. Not surprisingly, the turnover was high when people realized they didn’t agree with the extreme views of the group, and by the end of the second decade the KKK lost most of its members, and consequently -and thankfully- its voting power. The charm hanging off this man’s pants pocket looks unsettling…a skull? While some in my category of “Bad Boys” are jokingly there because they look the part, these men looked respectable, even upper class, and still they were motivated by hate…This is where the true danger is. For the boy’s sake I hope the gentlemen on the photo finally woke up and left the group too. As a side note, I think these were men of one family. Many seem to share similar physical traits. The dapper gangster look of the 20s-30s. RPPC. Private Collection. These four gents are wearing the classic suits and hats made iconic by the bad guys of the era. The gentleman to the front right has the perfect looks and demeanor for the style, doesn’t he? He looks like the leader of the pack, and he stands out wearing a light colored suit against his friends’ darker ones. Interesting detail is no one’s holding a smoke in their hand, but they’re all smiling! RPPC: I haven’t seen this type before. It has a stamp box with S in each corner. Handsome WWII German sailor. Kriegsmarine Heribert. Bremen 1943. RPPC. Private Collection. Smiling Heribert could have been an actor. He certainly had the striking good looks. But unfortunately he was a submariner serving under Hitler. Posting a picture of a German military guy from WWII is always an icky affair for some, but not for me. The Kriegsmarine crews manned U-boats. Those submarines earned the nickname of “iron coffins”. By war’s end, 28,000 out of 39,000 German sailors had died at sea. That’s 3 out of 4 wiped out, the highest casualty rate of all German forces. They did considerable damage to Allied forces too: 3,000 Allied ships (175 warships; 2,825 merchant ships) were sunk by U-boat torpedoes. The numbers are staggering on both sides. But let’s come back to Heribert. Without a last name there is no way of knowing if he made it through to the end or not, but the statistics are against him. Most German mariner casualties happened in the second half of the war when Allied technology advanced enough to effectively counteract their offensive. […] Memory / from Your Friend. Heribert. The other half of the postcard is blank. He had his picture taken in Kiel and he wrote this message from Bremen, Germany on November 25, 1943. From the little I understand of it, he addressed it to his friend and I see the word memory or souvenir (andenken). His Ns and Ms look like Us too, so this makes it doubly hard to try and translate. A German Tumblr person translated it to “To Eternal Remembrance”. There is no address and the postcard wasn’t posted, This was a picture he gave or left behind for his friend to find. Photographer: Kunstfoto A. Klein. Kiel, Holstenstr. 104. Germany. I do not support racism, intolerance or other extreme views. I have American, Russian and British soldiers who fought the same war in this collection. And while I understand the knee-jerk reaction of demonizing anyone who wore the Nazi uniform I like to dig beyond the surface. I don’t see the world strictly in black and white terms and believe your average drafted WWII German soldier, sailor and pilot began the war for family and country but ended it disillusioned and horrified. They did what every soldier does in wartime: go on missions and hope they and their friends survived it to see another day. The alternative for the Germans was execution. By the second half of the war 100,000 of the German military took the risk and deserted, 25,000 of them got caught and executed, and tens of thousands more ended up in concentration camps or “punishment battalions” where they were made to do the most hazardous tasks. By comparison, only one American soldier got executed for desertion, Eddie Slovik. With all this said the SS and gestapo’s horrifying war crimes were deliberate and absolutely inexcusable in any way; you won’t find any of them on this blog. “I was a good soldier. I see today that because of that, I was merely a good tool for an unbelievably criminal regime.” Heinz Otto Fausten. WWII German infantry veteran. Hardy. Boston. Cabinet card. Private Collection. A possible Victorian gang member? This hatted young man from the 1890s is described as “one of the Alleys” on the back of the card. It seems to me the writing was added later on, perhaps by someone who knew not who, but what the person was part of. Sounds like a gang name to me, and the fact this card was made in Boston adds to the possibility. Well, in any case this handsome gentleman in profile was dressed to impress, and that’s one stylish hat on his head. “One of the Alleys”. Boston. Hardy back of cabinet card. Photographer: Hardy. 493 Washington Street. Boston. MA. WWII German pilot. Snapshot. Private Collection. Ah, the enemy…the one we loathe. This picture spoke to me. This German pilot is leaning to the side so the model plane is in the shot. The picture gives me the feeling that flying was a dream of his from childhood, and it most likely was. Too bad this one grew up to become a pilot under Hitler’s rule. Sad, sad, sad. This pilot fought for the wrong side and paid the price whether he survived or not. I collect these pictures because they remind me of the universal tragedy of war. The enemy had a face and family too and a life, and dreams, and not all of them were evil, they followed orders like every soldier has to do. Bribing the copper. RPPC. Private Collection. Ok, this arcade RPPC is one of my top favorites. Buddy #2 is in a cop costume -complete with the blackjack and cigarette in mouth-, he’s looking about, making sure no one’s watching him, accepting a bribe from jailbird Buddy #1. Too much! Larceny in progress on this RPPC! This staged stick up looks pretty good! Unlike most prank photos I came across no one here is giving the hint this is so. Nice job, fellas! Usually people smile and take on an exaggerated pose with hands raised, and the guns are held with bent arms. Here the robbers are aiming their rifle and gun the right way. Everybody looks to be in front of a horse stable. I wonder what those small barn style windows are for. They seem too high for a horse head (and they’d probably be facing in), but they could have been used for ventilation. The victims are handing out coin purses -no wallets back then! So, is this a prank robbery by some friends wanting to do something fun instead of a boring group picture? Maybe. Or this could be a reenactment of a robbery which actually happened.